President and founder of Ahimsa Partners. Jean-François worked at Institut Mérieux for 29 years, where he held several international positions, participating in the group’s international expansion in Europe, Asia, Middle-East, Africa and Latin America. In January 2004, he was appointed the Corporate Vice President of the Holding Company, in charge of Global Health and International Affairs. From 2005 to 2009, he was President of the European Diagnostics Manufacturers Association (EDMA), the European organization representing the In Vitro Diagnostics industry. He was Treasurer of Fondation Mérieux for four years. At the same time, he joined the Stop TB Partnership (World Health Organization) as a Board Member, representing the private sector. He has been elected as a member of the Executive Committee of the Partnership. 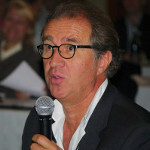 Through his extensive international experience in both developed and developing countries, Jean-François acquired unique skills in the field of Global Health. His strong commitment to responding to emerging countries’ urgent needs motivated the launch of Ahimsa Partners, in January 2010.Through innovative business and financial models, and the collaboration with new generations of leaders, Ahimsa Partners proposes innovative partnerships in the field of Global Health. Ahimsa Partners’ objective is to engage the various stakeholders from the global Health landscape (private and public sectors, international organizations, foundations, NGOs…) in order to bridge the world. He developed an innovative concept for the Corporation: “from social responsibility to the creation of shared value”. From June 2008 to June 2014, Jean-François acted as the President of Bioforce Institute, a Human Resources Management organization for International Aid that works with NGOs and trains over 350 students on humanitarian actions every year. Additionally, Jean-François is involved in many projects related to the “bottom of the worldwide pyramid population” and “social business” approaches; with top tier international Business Schools (Hong Kong University, Georgetown University, INSEAD, HEC, EM Lyon, BRAC University). He teaches Business Ethics at HEC in collaboration with a Benedictine monk. He contributed to the Global Compact initiative in France from 2002 to 2007. He is a member of the Scientific Advisory Board for the Lawrence Berkeley National Laboratory’s Institute for Globally Transformative Technologies. He is the Founder and the President of Ahimsa-Fund.